Top quality unfolded leaflets and flyers. See 'More Details' for full description. The time stated for dispatch is for 'approved' artwork. Requesting a proof is likely to affect this deadline if the artwork isn't approved within the time stated. The countdown timer displays the actual date this specification could be dispatched. Change this option if you need it faster or cheaper. Because it's 'just a leaflet' doesn't justify cheap and nasty which is why Flexpress never compromise on quality. Each job is printed individually to ISO 12647-2 international colour standards at prices you'd expect to pay to printing companies more accustomed to ganging jobs together. Silk, gloss and uncoated paper options over a full range of weights give you one of the widest ranges of environmentally accredited 'A' grade branded papers available anywhere online. Every job at Flexpress is printed individually with care and attention and without ganging or batching using the finest technology available. You wont receive any products printed on beefed-up photocopiers from us - another reason we back everything with our total satisfaction guarantee. 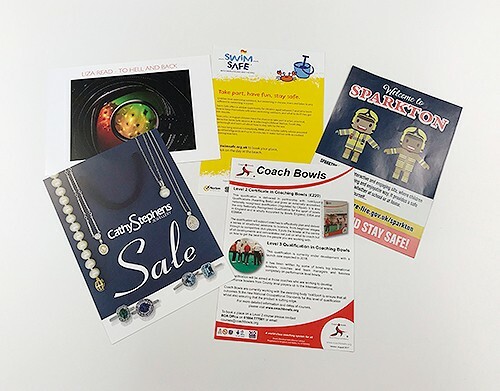 Our leaflets are printed either lithographically using LED UV inks or using HP Indigo offset which is arguably the finest digital technology available. Our leaflets are trimmed using highly accurate programmatic guillotines. This ensures that even those with even borders are cut as accurately as possible. They're then packed in extra-strong, double-walled, unbranded cartons that will stand up to the rigours of national carriage. And because we pack to a maximum of 15kg per parcel - you won't have to be superman to lift them! *If ordered before 12 noon. Allow one extra day if ordered after 12 noon. All orders are dispatched by reputable national carriers on a next working day service. This will usually arrive by 5pm although please be aware once goods have left our premises we have no influence on when they are delivered. If you would like to upgrade to a AM or Saturday delivery, please contact admin@flexpress.co.uk who can arrange this for an additional cost. Flexpress started life back in 1989 and are UK based keeping British people in jobs. Everything we offer is printed and finished in-house by us as our 8000 square foot premises in Leicestershire. We're proud of our facilities and unlike many of our competitors, we welcome visitors at any time. We take quality and customer service very seriously. Our right-first-time approach coupled with cutting edge technology and professional team mean we're confident enough to offer a total satisfaction guarantee. If through any fault of ours, there's an issue with your printing, we'll always arrive at a solution to leave you 100% happy. Please choose a template below for your project. Can't find the size/style you're looking for? Contact us about custom sizes and quotes. The download link is for a PDF template - we recommend you lock these on a layer behind your design so you can ensure all artwork is accurate and in the correct position. For artwork best practice, take a look at our Artwork and File Information page.